At Quality 1st Basements, we have the products and professionally trained foundation contractors in-house that you need to permanently solve your foundation issues. Each of our contractors specializes in foundation repair solutions -- it's what we do every day! Foundations old and new can experience damage from expansive soils, settlement, frost, and other forces. That's why we at Quality 1st Basements prefer to address these problems on your existing foundation -- with warrantied, permanent solutions. At Quality 1st Basements, we're here to fix your foundation problem -- no matter what it is. We have the specialized equipment, products, and professional experience you need to make permanent foundation repairs. Call or e-mail us today to schedule your free quote! We proudly serve New York City, Brooklyn, Bronx, areas nearby such as Manhattan, Staten Island, Flushing, Astoria, Queens, Elmhurst, Ridgewood, and the surrounding areas. Expansive soils and hydrostatic pressure can push against foundation walls and cause inward movement. Foundation walls can bow inward, tilt at the top and/or slide at the bottom, causing cracks and even collapse of the wall. Foundation walls can be stabilized using wall anchors, steel beams, or fiber-reinforced polymer. We offer a variety of proven systems to stabilize cracked and bowed basement walls. Bowing and/or tilting basement walls are caused by pressure from the surrounding soil pushing against the foundation. Cracks in the masonry are usually an early sign of a problem. Foundation wall anchors can not only stabilize bowed basement walls and prevent them from bowing and/or tilting any further, but our wall anchors can also be tightened when the soil around your house shrinks during dry periods. This allows for improvement and straightening of your bowing basement walls. Street creep is a problem caused by thermal expansion and contraction of exterior concrete pavement surrounding a home. Home builders install expansion and control joints in the driveway to protect the home from expansion forces caused by temperature fluctuations. When this expansion takes place, the concrete street elongates and can push against the concrete driveway, which then pushes against the garage slab or foundation slab. This pressure can cause foundation walls to crack. Repairing a foundation that has been damaged by street creep can usually be repaired by first installing new expansion joints. Foundation walls can be stabilized using wall anchors. Foundation settlement happens when the soil under your foundation fails to support its weight. Specific causes of a settling foundation include frost heave, expansive clay soil and soil that is saturated by heavy rain or a major water leak. When a foundation sinks, symptoms can include basement wall cracks, windows and/or doors that are difficult to open and close, and cracks in exterior brick. The typical repair for foundation settlement is to use foundation piers to transfer the weight of the home to competent soil or bedrock. Sagging or unlevel floors above a crawl space create many issues inside the home, such cracked tiles, noisy floor joists and bouncy floors. Sagging, uneven floors can be caused by a variety of problems, including sinking support piers or columns, failing floor joists, sagging or rotted support beams and/or sill plate failure. Sagging crawl spaces can also be a result of improper spacing of the support columns. The typical repair for a sagging crawl space includes installing additional crawl space supports to stabilize the structure and help re-level the floor. Mold and rot should also be addressed and prevented. The crawl space can be kept dry with a dehumidifier and crawl space liner. Concrete slabs, including foundations and outdoor slabs, can be susceptible to settlement due to a wide variety of factors. 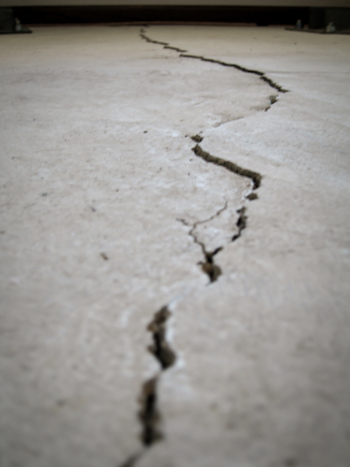 Poorly compacted soil, soil erosion and improper drainage can all lead to concrete settlement and cause cracks in the concrete slab. Mudjacking is the process of lifting a sunken concrete slab by pumping grout through holes in the concrete, which pushes the slab up from below. The concrete leveling process is also commonly referred to as "slabjacking" and "pressure grouting."